A man from Baltimore hits the submit button after filling out a form on Vaja�s website. Ten minutes later, a Vaja employee in Argentina prints out the order. He hands it to a Vaja �artisan,� who then builds the case from precise instructions outlined in the order. One month later, a teal, vaquero leather, logo-embossed, and custom cut PDA case with matching cell phone pouch arrives in Baltimore. Such is the process by which Vaja, a portable electronics case maker, manufactures its custom cases. Argentina-based Vaja specializes in elegant, handcrafted leather cases including custom, user-configured cases such as in the case illustrated above. 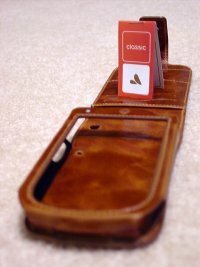 Their cases are crafted from various leathers, including alligator and ostritch, and are precisely cut to specification. So when I received my Vaja leather case for Dell Axim X50v in the mail, I was eager to see if it lived up to all of Vaja�s claims. In short, it did.